https://www.golfdiscount.com/wellputt-welling-putt-pro-10-mat?___store=default 103189 WellPutt Welling-Putt Pro 10' Mat https://media.golfdiscount.com/catalog/product/w/e/welling-putt-pro-10-foot-mat.jpg 119 119.0000 USD InStock /Accessories /Accessories/Training Aids /Accessories/Training Aids/Golf Practice Mats & Hitting Nets /Holiday Sales /Holiday Sales/Accessories /Brands/WellPutt /Holiday Sales/Accessories/Golf Training Aids Welling-putt Pro is the ultimate putting mat, not just by its concept, but also the quality of its texture and the exercises provided in its Training Book. A good putt is the result of a good aim and the right speed. This is why the Welling-Putt Pro is designed with two directions of play. One direction focuses on aim, while the other direction works on feel. The Welling-Putt Pro is made so you can develop a very strong sensitivity for speed. This mat includes multiple alignment guides and features the Welling-Putt Zone, or good-putt zone, which has two parts; Zone A is for uphill putts, and Zone B is for downhill putts. 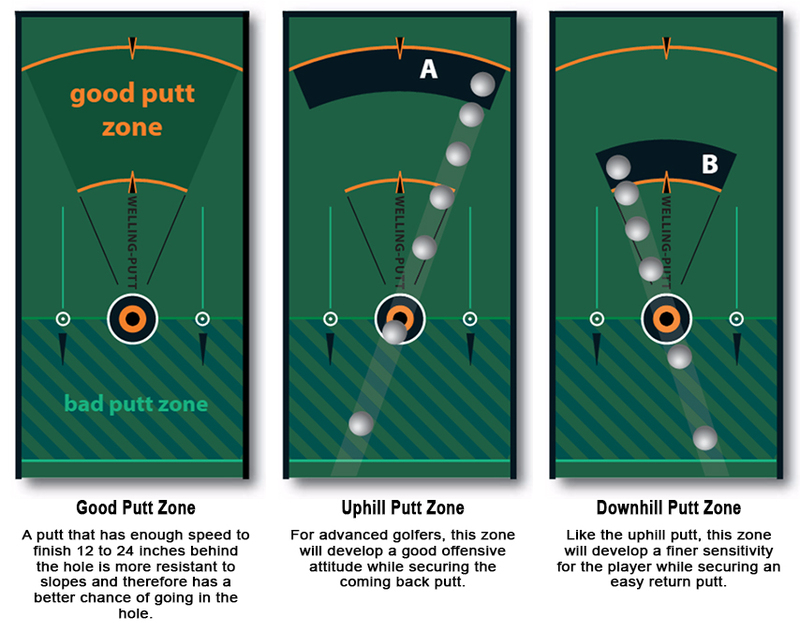 Putts have to roll over the hole and finish in Zone A or B depending on the excercise. Welling-putt Pro is the ultimate putting mat, not just by its concept, but also the quality of its texture and the exercises provided in its Training Book. This item ships from the manufacturer in 3-5 days regardless of shipping method. Deposit will be taken in full upon placment of order. shipping alert: This item ships from the manufacturer in 3-5 days regardless of shipping method. Deposit will be taken in full upon placment of order. shipping alert: This product ships directly from WellPutt Please allow 7-10 days delivery.